Bangalore-based QwikCilver Solutions Private Ltd., which is into gift cards programmes, has launched a new application christened 'woohoo' to aggregate payment options and pay retail outlets through mobile. The app, which is currently available in Android, would provide a platform to retailers, currency partners and consumers. Through this, retailers would be able to accept multiple currencies. Similarly, it would allow currency partners like Oxigen wallet and loyalty rewards programme points under Payback to be accepted across thousands of retailers. It would allow consumers to choose where the money comes from and they can seamlessly manage transactions from multiple wallets, gift-cards and loyalty points, through their mobile phones. "By partnering with India's leading retail chains, brand partners and currency providers, woohoo is empowering users with an opportunity of not only choosing where to spend but also optimising the use of virtual cash they may have in the form of loyalty points, reward points, gift cards and e-wallets," the company said. The app has partnered with over 50 brands enabling access to more than 3,000 stores and portals including India's leading retail chains, entertainment platforms, travel partners and leading currency providers. "This innovation would be an anchor to drive additional sales and footfalls for our strategic partner stores with a novel and robust mobile app based shopping experience," said Pratap T P, co-founder and chief marketing officer at QwikCilver. Last year, the company raised $10 million in a funding round led by e-commerce giant Amazon. The firm's existing investors Helion Venture Partners and Accel Partners also participated in the round. The startup was founded in 2008 by the duo of Pratap and Kumar Sudarshan. It has a Software-as-a-Service model (SaaS), enabling customers to launch the stored value card program with minimal upfront investment and provides suite of services to create, deploy and manage the programme. 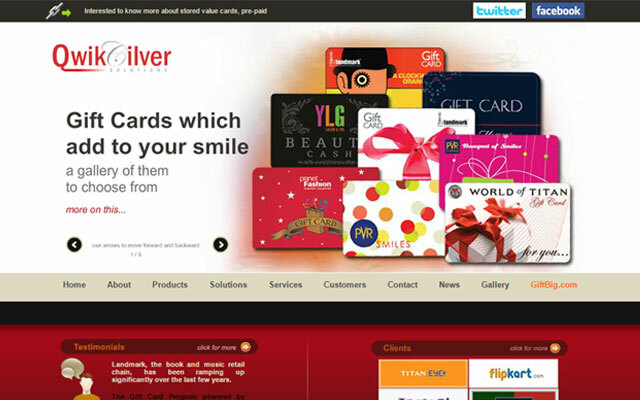 It also runs GiftBig, a B2C e-commerce platform that enables consumers and corporate to purchase gift cards and vouchers of various brands. The company claims to be currently serving millions of customers and corporate employees in India.